KUALA LUMPUR, Malaysia -- Former Malaysian Prime Minister Najib Razak was charged Wednesday with criminal breach of trust and corruption, two months after a multibillion-dollar graft scandal at a state investment fund led to his stunning election defeat. "I don't think it's fair for anyone to be judged on a media trial -- this is important," Wan Azizah said Wednesday at a conference in Mongolia. "The other thing is that, however I feel, I want the court to be independent and, therefore, give him all the avenue he has under the law to defend himself." 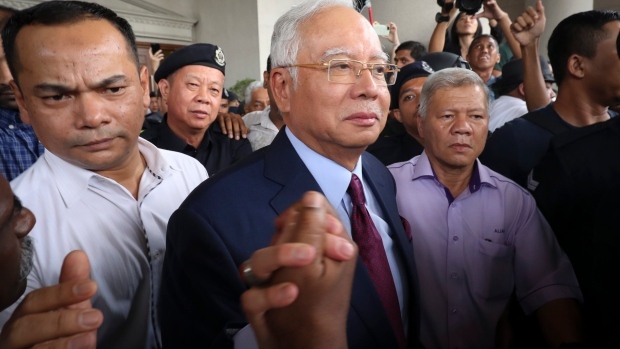 The attorney general's case says the $10 million that Najib allegedly received via SRC was a bribe for approving government guarantees of loans totalling 4 billion ringgit (nearly $1 billion) in 2011 and 2012 that apparently became part of the ransacking underway at 1MDB.